the images were too large with this many photos. It was time consuming because we coloured the images but worth it because she is going to use it on another page. I’ll show you the paper another day. Here is the page we worked on. A few of the photos aren’t the greatest quality because she was using her mom’s camera and wasn’t used to it but they are so cute, they were worth using. Sorry my photography isn’t great either. My photo booth isn’t much bigger than the page so it is hard to get the lighting right. 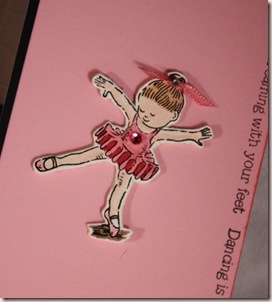 We stamped the base page with the phrase, “Dancing is like dreaming with your feet.” around all 4 sides. The stamps are clear so it wasn’t too hard to line up. The stamps on each end were stamped first to allow the middle ones to be centered nicely without measuring. Shawna is going to add rhinestones to the corners of her black mats to bring out a bit more sparkle in her page. Now that I look at it again, I think Shawna could also draw in an oval around the chipboard accent in pencil and add maybe 5 rhinestones at both the top and bottom of the oval. Sort of framing her without using too many rhinestones. Basically an arc above and below her. The ballerina accent is actually stamped on vanilla CS with Stazon, then glued to an ivory chipboard coaster, coloured, cut out, then sanded smooth. I saw Lauren Meader do this a few posts ago, her blog link (My Time, My Creation…) is on my sidebar if you want to take a look. She has a video teaching you how but definitely start with light-weight chipboard for this. Mine was medium-weight and I spent ages cutting it out. Isn’t she so worth it though? Thanks to Karen for NOT asking for this set back yet! Shawna, I promise new content tomorrow!! Already pre-posted! Ink: Stazon black, regal rose-SU! Paper: black, vanilla and pretty in pink CS-SU!